The Greens will be looking to turn their away form around when they face Dandenong Thunder at Dacland Stadium on Saturday night. After a disappointing loss away to the Melbourne Knights (0:2), Bentleigh bounced back last weekend, when they beat Hume City 2:0 at Kingston Heath Soccer Complex. The three points saw them climb to second spot on the ladder, only behind first-placed Avondale FC who have won all of their five games so far. The Greens also managed to keep a clean sheet for the first time this season against Hume City, mainly thanks to a great defensive structure and some top-class goalkeeping from Ryan Scott – a fact that John Anastasiadis would be particularly happy with. Dandenong Thunder had a mixed start to the 2019 NPL Victoria campaign. After losing their opening game against Hume City (0:4), they managed to get away wins at Kingston City (3:1) and at Jack Edwards Reserve against the Oakleigh Cannons (3:1). However, Thunder lost their last two games – at home against Altona Magic (1:3) and away to Heidelberg (0:2). Their inconsistent performances currently see them sit in 8th spot on the ladder. The Greens took all six points from last season’s encounters between the two teams. In round 6, Bentleigh recorded a convincing 3:1 win at Kingston Heath through goals by Hicks, Thurtell and Hatzimouratis. The second game in round 14 was one that spectators would talk about for a long time. Bentleigh took all three points in a 7-goal thriller. Goals from Kelly, Mitrovic, Hatzimouratis and Hicks gave the Greens a 4:3 win. Kieran Dover will be a player to look out for in the Thunder lineup. The former Bentleigh player looks lively in Dandenong’s midfield and has scored two goals in this campaign so far. Arnold Suew enjoyed a great starting-11 debut for Bentleigh against Hume City last weekend and it will be interesting to see, which players John Anastasiadis will choose to take on Dandenong Thunder on Saturday night. The Greens bounced back from their first season defeat in style and will now aim to get another three points away from home. 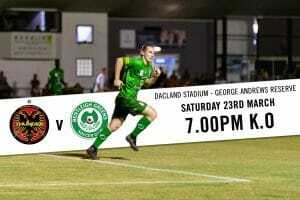 Dandenong will try to turn their form around and return to winning ways at Dacland Stadium on Saturday night.